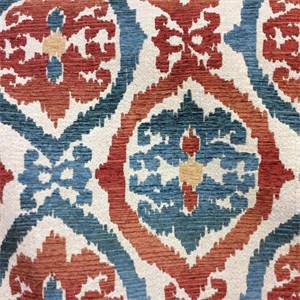 Want beautiful chenille Ikat upholstery fabric by the yard? This fantastic woven chenille red Ikat fabric almost has the feel of cut velvet upholstery fabric. You will love the soft hand and warm feel. Just think of all the uses for this Swavelle/Mill Creek upholstery. You'll find it excellent for sofas, chairs, decorative pillows, ottomans and even duvet covers. Beautiful and pretty easy to care for.